We can’t begin to tell you how we’ve watched this fabulous product increase in popularity each year, since we began to introduce them on our website. Not only do they present beautifully as a centrepiece for any feast, but they provide enough delicious sticky roast pork to feed at least 15 -18 very hungry adults, making them a perfect alternative to the traditional roast turkey. The most common questions we receive are “Will it fit in a domestic oven?” and “How do I cook it?” so I hope to put your minds at rest here in this section. We also sell Porchettas, which are a boneless, rolled version of the same thing, which is equally delightful to eat but has less of an impact visually. These also come in smaller joints though, so may well suit smaller gatherings. Our piggies are either intact (arriving with their head and feet left on), or are “butchered” where these are completely removed. They always come oven ready. The reason that we offer this option is that the original suckling pig was traditionally brought to the table on a large platter with its head on, usually carrying an apple or similar treat in its mouth, with its feet curled underneath. If this is just a little too traditional for you, then we would suggest that you have the head and trotters removed before you have the piggie sent to you. As we order in whole litters at a time we usually end up with pigs all at the same size, which is approximately 10kg in weight and the average length of a whole pig is 26″ or 66cm. We have found that it is possible to curl them around in a large Turkey Roasting Tin although they do fit better and more easily in a domestic oven with the head and feet off. A little trick you can use is to remove the head/feet (either yourself or ask us) and to cook these alongside the piggie … then “re-attach” the head before presentation. (Hence the Franken-pig reference!) Traditionally whole roasters were brought to the table with a garland of holly and bay leaves around their necks for decoration … you could always hide the join with a similar idea! 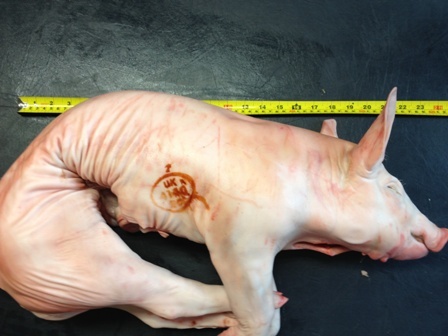 Here is a photo of a whole unbutchered suckling pig. Obviously, once the head and trotters are removed the pig begins to look more like a large pork roasting joint, but it is still spectacular and absolutely delicious! Rub the pig all over with vegetable oil (we use olive oil) and then some lovely sea salt. Heat your oven to a nice strong heat, around 200 degrees C and bake the piggie for at least an hour until the crackling develops and begins to look golden and crispy. Now you can reduce the heat down to something like 160 degrees C and roast for a further 2.5 hours or until you are sure the juices are running clear when you pierce the deepest part of the pig. Resting is quite an important part too – remove from intense heat to a holding oven or place foil around the tray and pig and keep warm for about 30 minutes before carving, for great results. Personally i like to literally pull the suckling pig apart, it lends itself to shredding – whereas it is very easy to get slices from the porchetta which has its stuffing centre and stringing to keep it nice and round. One of our customers has recently pointed out that he was purchasing a half-suckling pig, and he was anxious to ensure he treated his half-pig with just as much respect as the whole pigs described above. Between us we decided that a good measure of cooking time would be to reduce the above cooking times by about a third. 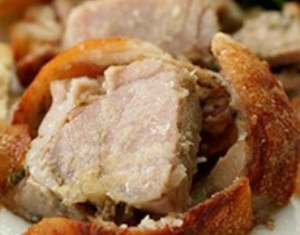 Although the skin is very thin and crisps quite easily, there is a nice layer of fat that protects the meat during the cooking process, so as long as you reduce the heat down and cook slowly after you have kick-started the crackling, it is really quite difficult to ruin this dish! Take about three large cooking apples, (peeled, cored and sliced) and put them in a pan, then cover with a lid. Place the pan on a low heat, and add 50g of butter and 50g of caster sugar. Stir occasionally, for about 15 mins until the apples break down into a purée. Stir to knock out any lumps, then tip into a serving dish.